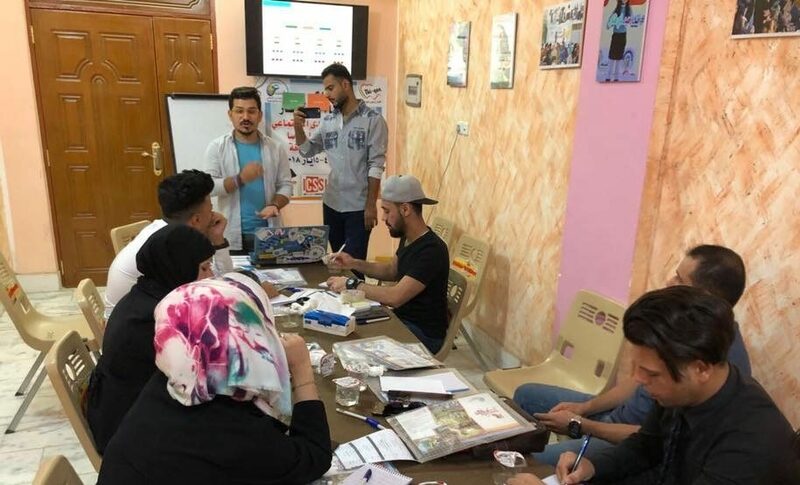 To support the presence of the Mashufna Cultural Center in the civil society of Nasiriya, the Center held a training for its young volunteers. The goal was to develop its activists’ skills in campaigning planning and analysis, target identification and methods of evaluating campaign results. Increased contribution of youth in Nasiriyah in the cultural and knowledge fields. Participants discussed the low literacy levels of many young people in Nasiriyah, and the lack of interest in cultural and scientific activities in general. In response to this, trainees suggested holding a festival called “Dhi Qar Readers” as well offering public seminars to encourage young people to engage in cultural activities, and to involve institutions such as Dhi Qar University and the Education Directorate in the province. Enhancement of women’s freedom in NasiriyahParticipants acknowledged that there is no suitable environment for women to work in Nasiriyah. Some ideas emerged to address this problem, such as holding seminars for women where they might discuss ways to create better working environments for women. They also considered the possibility of launching a campaign on social media highlighting the importance of women’s participation in the workplace. Finally participants suggested gathering together employers, companies and investment banks and encouraging them to open their doors to women and providing them what they require to work. Provide direct support for the existing campaign “Our Marshlands as World Heritage” launched last year. Participants suggested organizing a voluntary initiative to provide media support to the museum by writing about it and its importance, and spreading these posts on social media. They also discussed inviting Iraqi media to visit and report about it. A campaign encouraging schools and universities to visit the museum for their annual educational programs was also considered, as was advocating with the Iraqi government to allocate financial support to sustain the museum. The Mashufna Cultural Center will continue to work on these topics with the volunteer teams in the city. Twelve young people, including two women, representing various volunteer groups working in the “I Love Thi Qar Forum”, participated in the training which lasted for two consecutive days. These teams are: Ambitious Humans, the Dhi Qar Youth Team, 14GK Group, the Dhi Qar Young Ladies and the Mashufna volunteer team. This training is part of an ongoing cooperation between the I Love Dhi Qar Forum in Nasiriyah and the Iraqi Social Forum based in Baghdad, together with the Iraqi Civil Society Solidarity Initiative (ICSSI), the Italian Organization, Un Ponte Per…(UPP) and the Information Center for Research and Development. The Mashufna Center aims to promote the values and principles of the Iraqi Social Forum: social cohesion, peace-building and spreading the spirit of peaceful coexistence among the people of Iraq.